They will see the Son of Man coming on the clouds of heaven with power and great glory (Matthew 24:30). This verse comes to mind when meditating upon the rich imagery of the altar in the Wenzelkirche (St. Wenceslas Church), the parish church of Naumburg, Germany. Here we have an example of baroque church art (17th century), which tries to convey the splendor and majesty of God. A flurry of activity seems to be captured in the stone, charging the whole scene with power. At least 11 angels are depicted in their ministry to the Lord, including the Archangel Michael overpowering the dragon, Satan. Yet, the central images of Christ are not lost among the gilded sculptures. 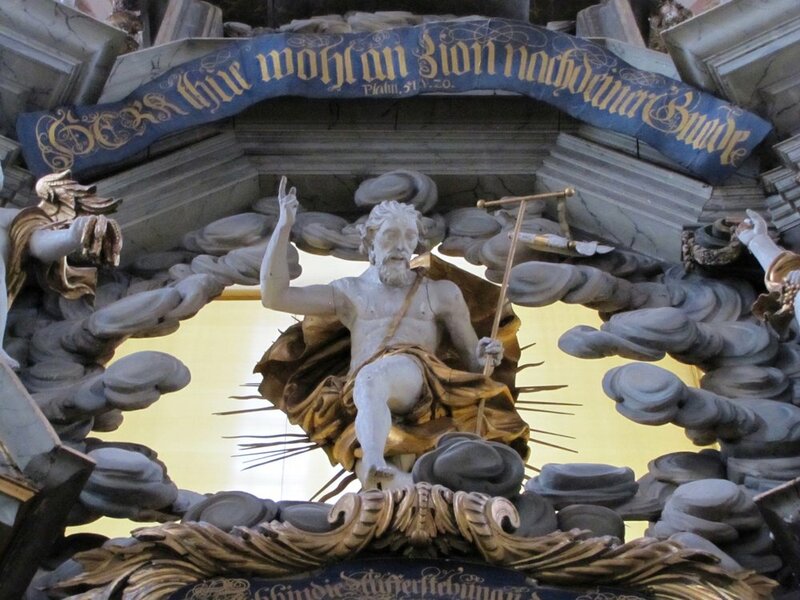 As is common on Lutheran altars, you see images of both the crucified Christ and the risen Christ. The central panel displays a painting of the crucifixion. Above that is the statue of the risen Lord. The central statue of Jesus seems to serve for His resurrection, His ascension, and even for His glorious return. Notice the sculpted clouds surrounding the altar and the victorious Christ. These clouds should remind us of the Lord’s glory as it was seen by Israel in the Tabernacle and the Temple. For the cloud of the Lord was on the tabernacle by day, and fire was in it by night, in the sight of all the house of Israel throughout all their journeys (Exodus 40:38). This is the same glory cloud that overshadowed Jesus and His disciples on the Mount of Transfiguration (Luke 9:34). This is also the cloud that took Jesus from view in His ascension (Acts 1:9). And in the same way, He will return on the Last Day, coming on the clouds of heaven (Matthew 24:30). This recurring cloud is the visible, palpable sign of God’s presence. The clouds carved into this altar point to that presence: the glory of the Lord with His Israel, with His disciples, and now with His Church at His altar. Clouds on the altar mean God is here. The vision of Christ’s return is also described in Revelation 1:7, Behold, He is coming with the clouds, and every eye will see Him, even those who pierced Him, and all tribes of the earth will wail on account of Him. Even so. Amen. When Christ returns He will still bear the marks of His victory, the wounds from the nails and spear; and on that Last Day, these marks will be a judgment against those who rejected Him and did not believe. Yet, those glorious scars will be a source of joy for those who believe His Word now and eagerly look for His appearing. It is good for us to consider this before an altar: both the wounds themselves that Christ received on Calvary when He won salvation for us, and also His return when He will bring that salvation to its final consummation. It is good for us to consider this before an altar because now is the time of salvation, and here at the Lord’s altar the fruit of those wounds is offered: the body and blood of Christ for the forgiveness of sins. Although they may be too small to see in these pictures, the altar also includes four angels holding grain, the paten for our Lord’s body, grapes, and the chalice for our Lord’s blood. We no longer see a bright, shining cloud pointing to God’s presence, but we behold His glory when we eat and drink His true body and blood in the bread and wine. God is here. While the altar in your church may not be so elaborately carved with glorious clouds and angels, approach that altar with fear (yes, even trembling), love, and trust, gladly receiving what our Lord comes to give. Kneel at the altar, open your mouth, be fed by Him, all the while looking forward to that Day when this same gracious Lord will come for you on the clouds of heaven with power and great glory. Come quickly, Lord Jesus. Amen. He has made me and all creatures, and it is my duty to thank him.